Today we have a fun and bright boy layout to share. "I have a really simple tutorial for you today that could be useful for labeling scrap and art supplies, but I can also see possibilities in the pantry, a child's play room or for shop owners, what about glass containers for flowers or brads etc. I am in the process of setting up my primary school classroom at the moment, and since it is an art classroom, I need lots of storage for supplies. I had heard of chalkboard contact before and wanted to give it as try. 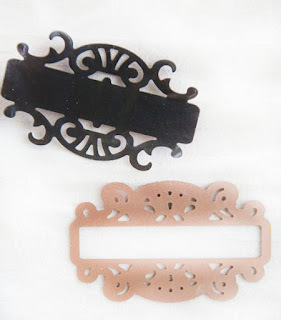 Imagine my delight when I saw how incredibly well it went through my Grand Caliber. It looks like plain black book covering contact, only you can write on it with chalk. How awesome! 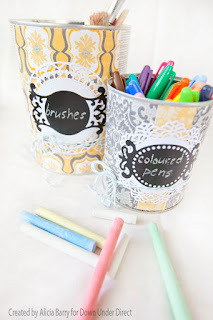 So I set about gathering lots of containers." 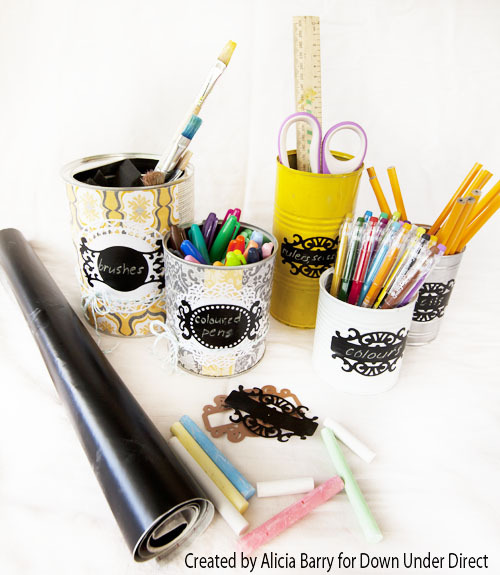 Cover your containers with patterned paper or spray paint. 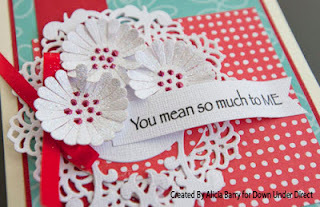 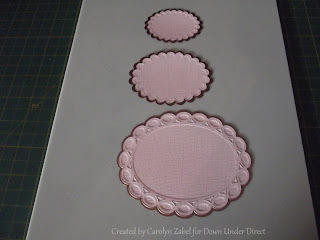 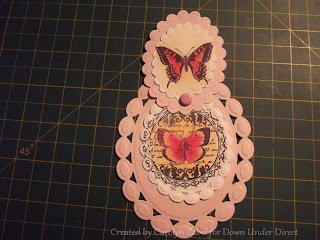 From cardstock, die cut a circle or doily shape depending on the size of your container. Adhere to your container. Apply a sealant over your paper. 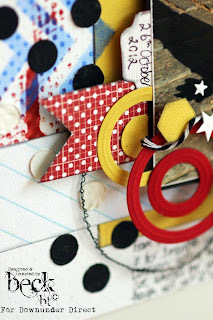 Die cut your favourite label shape from the chalkboard contact. 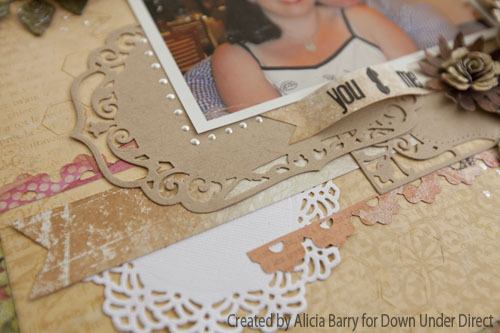 Peel of the backing paper and adhere directly to your project. 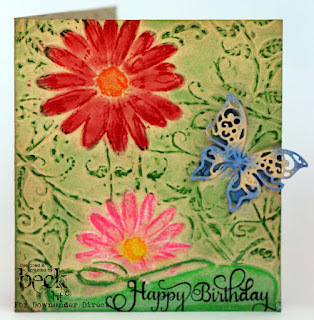 Tip: While regular chalk works great, liquid chalk pans give a much bright result and tend to stay out a little better. 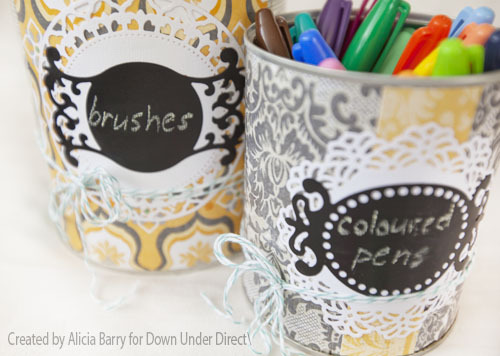 Altered tins are a great way to recycle your Milo tins. 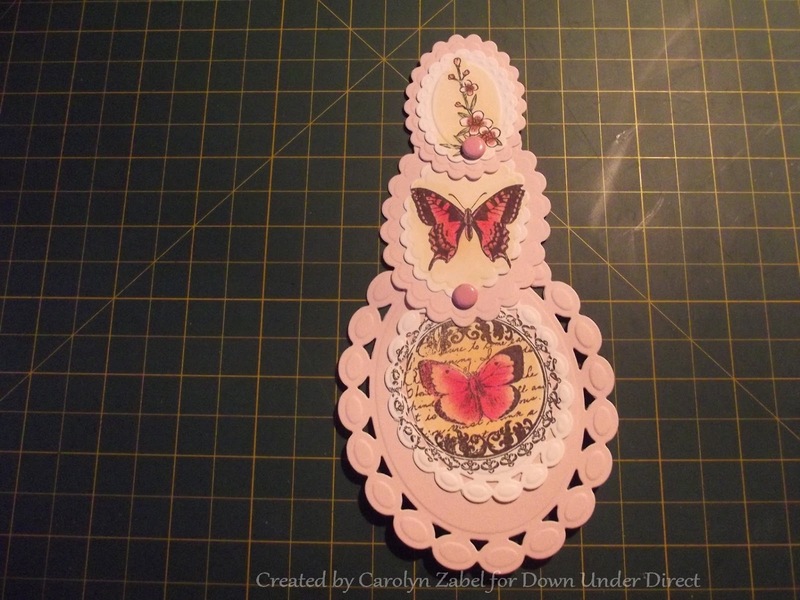 Here is a sample from Carolyn. 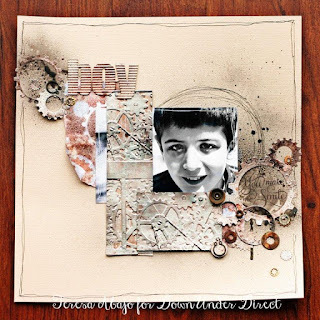 Today we have a layout that uses a multitude of Spellbinders including some of the latest released dies. Spellbinders new 3 D M-Bossabilities folders are so deep and detailed they make a beautiful card with only the simplest of embellishments. 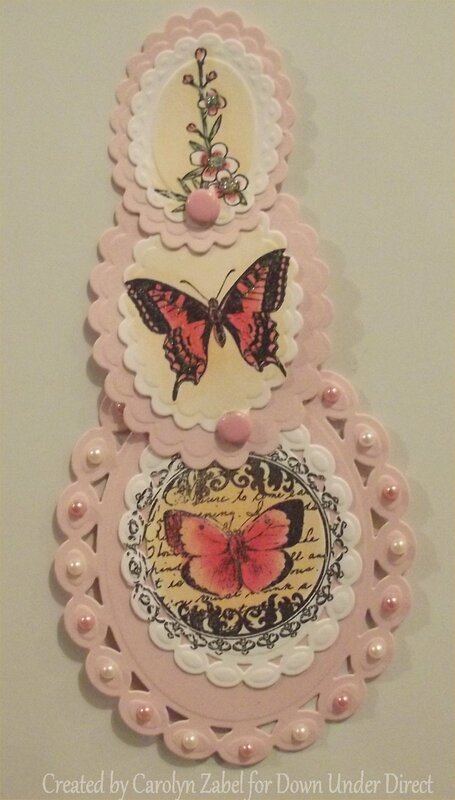 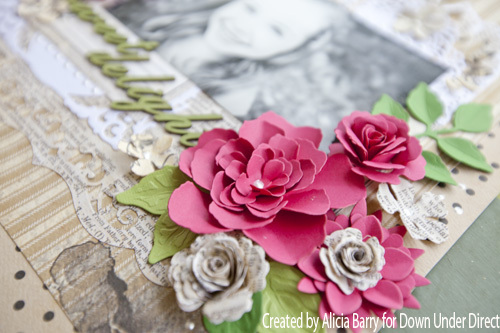 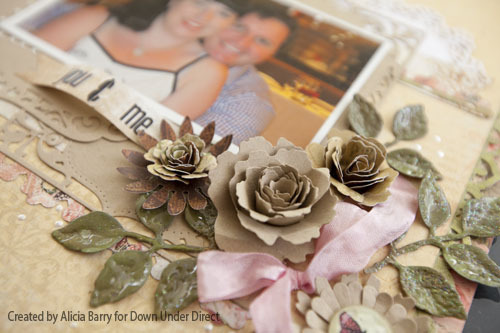 "It all got very messy in my craft room when I put this grungey layout together. Lots of painting, inking and spraying fun. 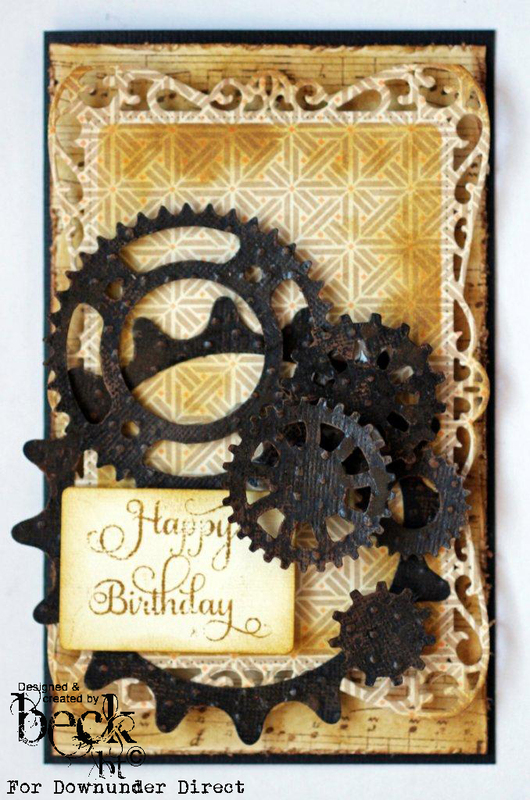 Thank goodness I didn't have to look too presentable for the next few days - my hands were mechanic filthy! I used one of the new 3D M-Bossabilities folders - the depth and detail in them is fascinating! 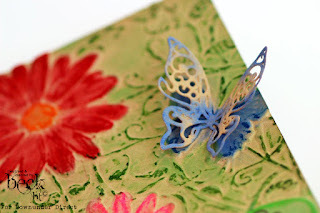 There were lots of oohs and aahs as I applied each medium - first the paint and then the ink and lastly the Glimmer Mist spray, each layer bringing out a new level of detail. 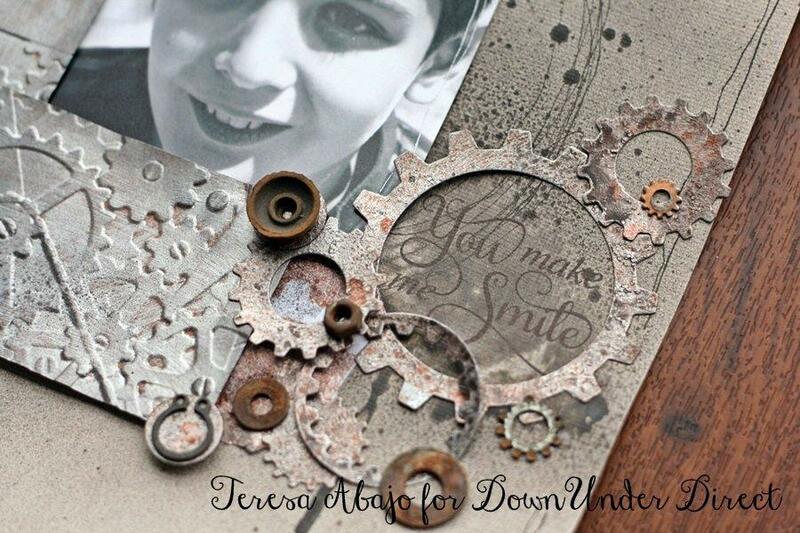 All of the elements were layered around the photo, and even the scrap paper I was using to spray the cogs was incorporated!" 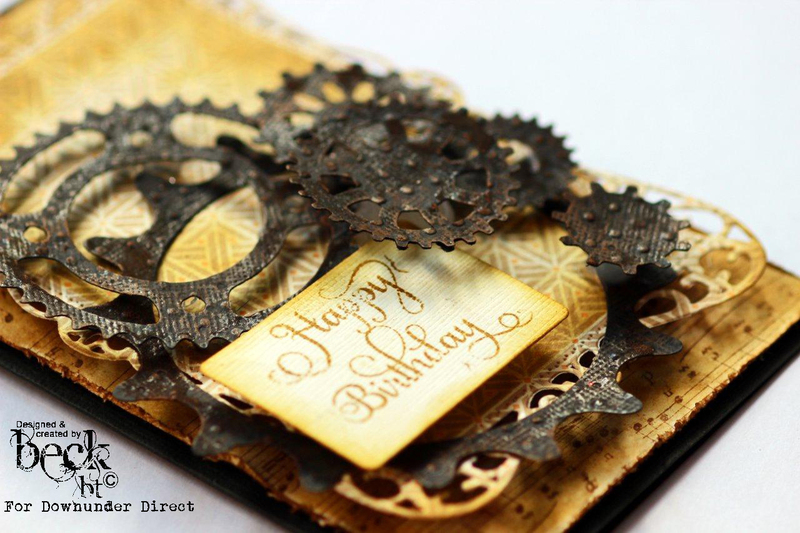 Masculine cards are often a challenge but the Sprightly Sprockets die makes creating boys cards a breeze. 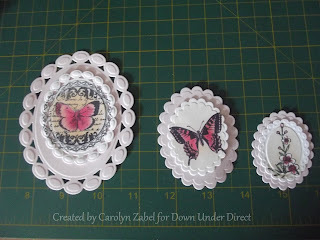 Using wax paper to test out stencilling Cut the die out using a layer of wax paper. I usually do this on more intricate designs as they come out so much easier, with little damage. 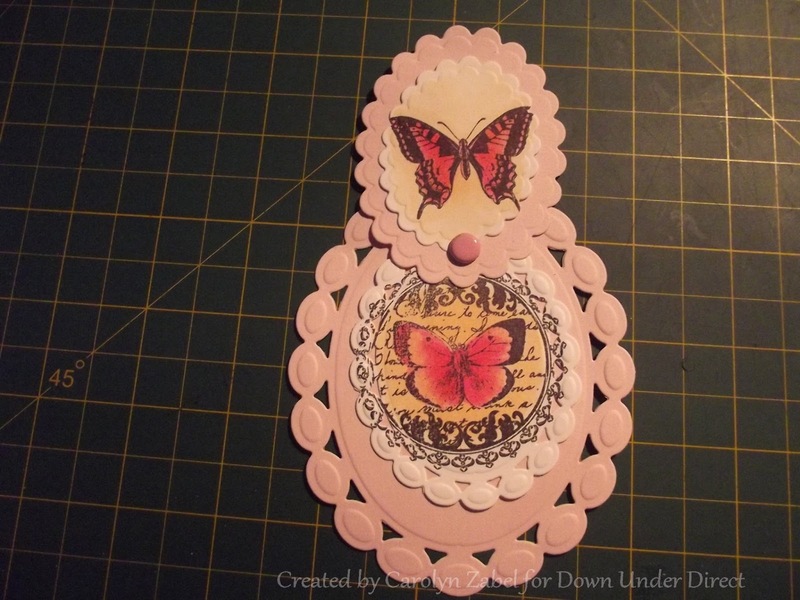 Leave the die in place and using some ink, ink inside the die. 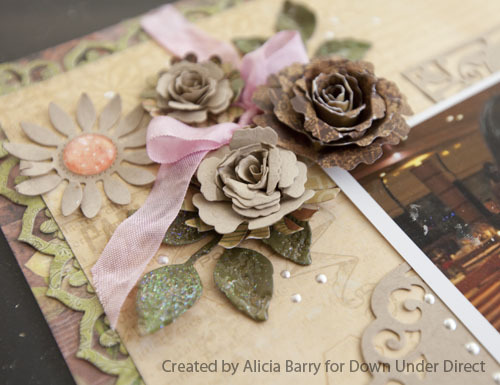 This enables you to see what the finished look will be before you commit to doing it on the actual paper, as you can see the design through. 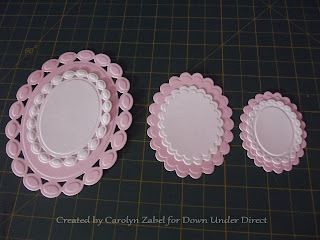 Lastly lift the wax paper to begin the process again if you are happy with the look. In this card I also added a little ink to the very edges of the design to tie in the inking a little more . 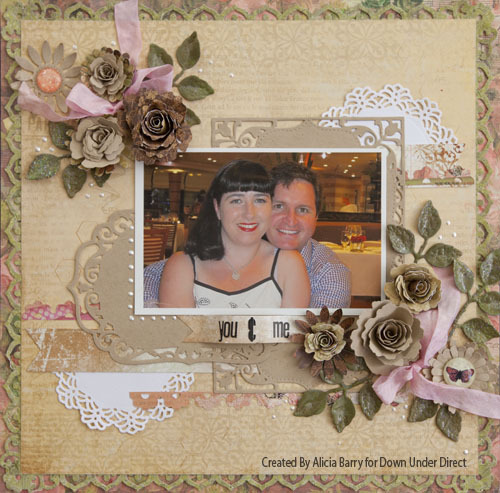 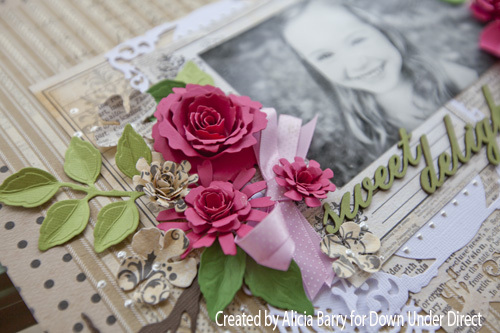 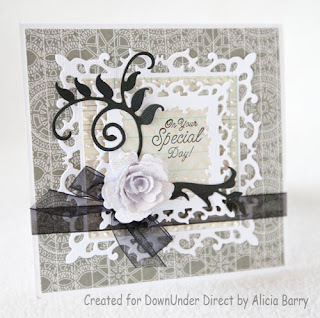 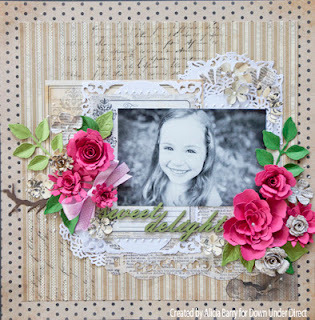 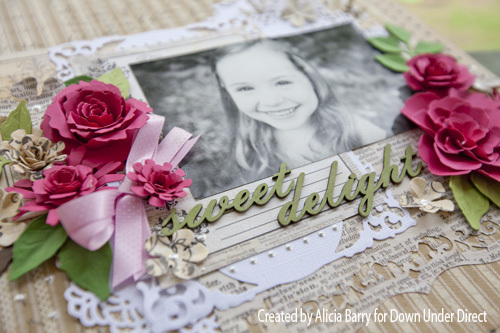 Today's project features one of the newest Spellbinder dies- Ornate Square. 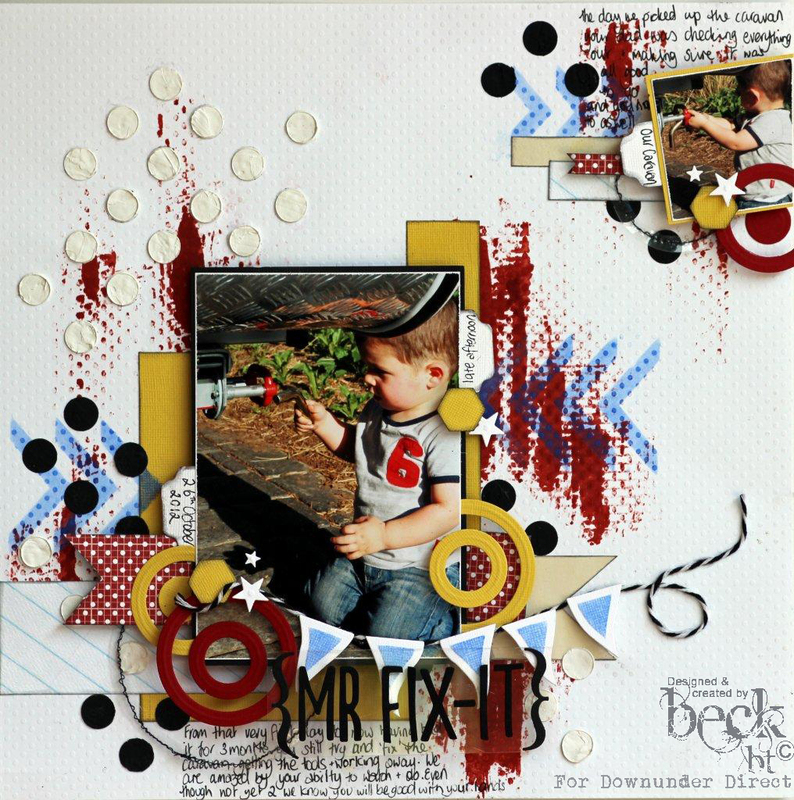 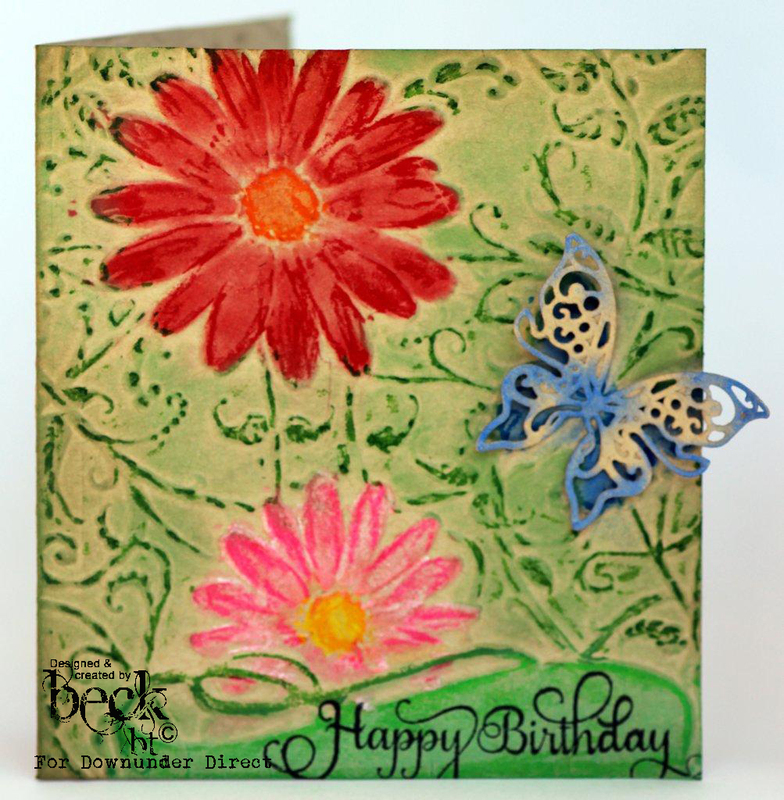 Today we have a bright and cheerful Birthday card from Beck. Welcome to Tutorial Tuesday. 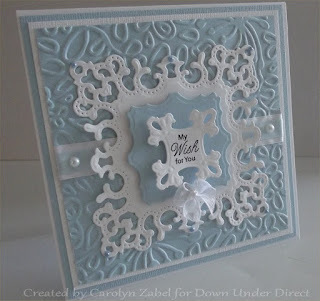 Today we have a tutorial from Carolyn for a Telescopic card. First you need to choose 2 sets of complimentary dies, you may also use 3 different dies so each section of the card is a different shape. 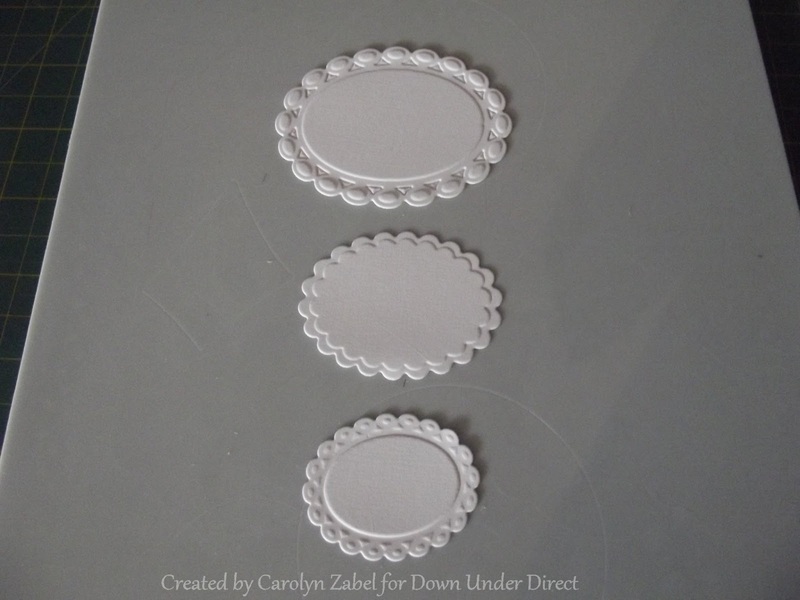 I chose scalloped ovals small and Beaded ovals. 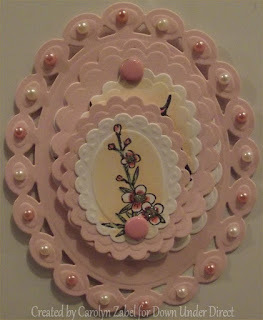 You can make this with more layers but for today’s tutorial I am only making it with 2. Chose the 3 largest sizes of your dies and cut out and emboss 3 die cuts which will form your bottom layers of the 3 shapes. Cut out 3 of the next smallest of the dies you cut out in step 2. Adhere your smaller die cuts onto the larger die cuts. Stamp or decorate your shapes to your personal choice keeping in mind you want them as flat as possible so they can move correctly when they open and shut. 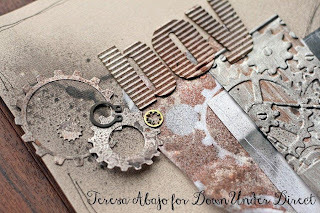 Place a hole using a piercing tool or a very small hole punch in the bottom of your middle sized die cuts, Then line up your medium sized die cuts that you just hole punched and place it image upside down on the largest die cut and using the hole you placed in the medium one as a guide punch a hole through to the largest die cuts. 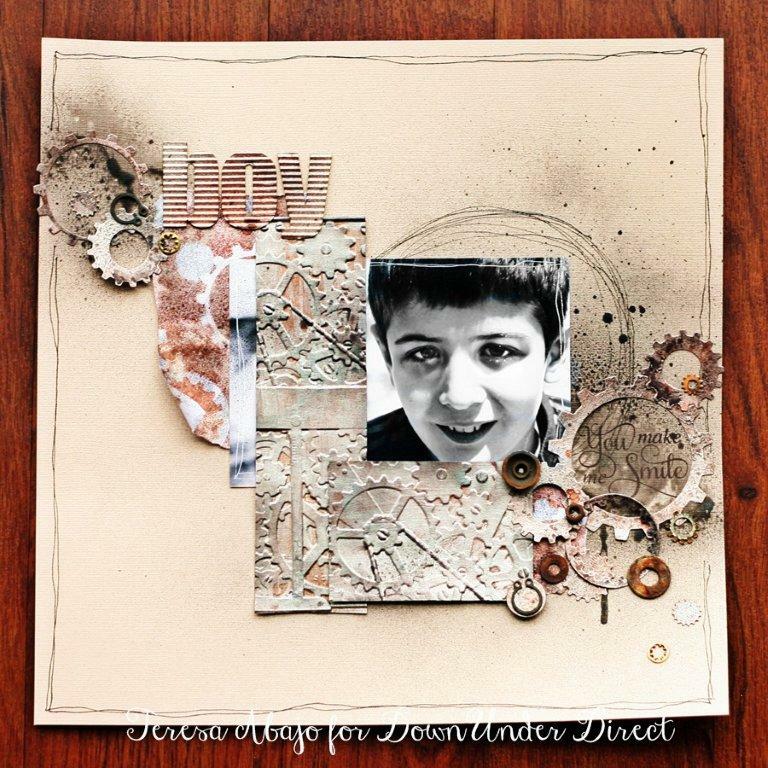 Adhere those 2 medium and large sized die cuts together with a brad. 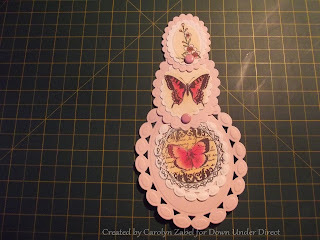 Now the first 2 layers are attached your card is starting to take shape. 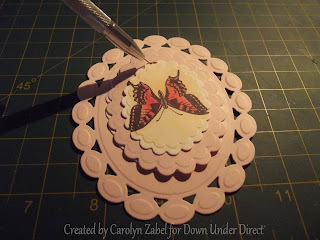 Now moving onto your smallest die cuts cut a hole in the bottom of your stamped image, once again line it up image upside down with the top of the medium die cut punch a hole and add a brad. 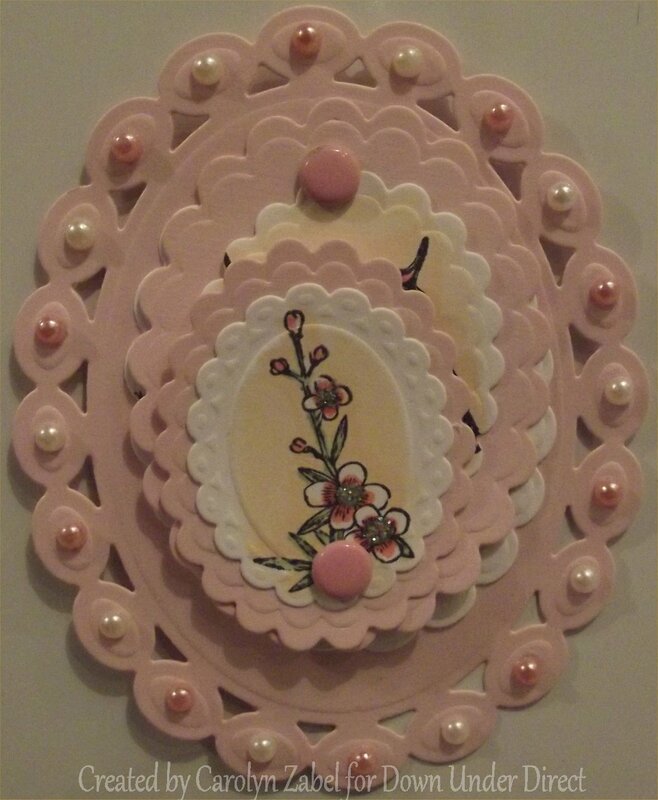 Your card is completed, Thanks to the brad your layers of die cuts will swivel out and around so they are all up the right way when the card is open. 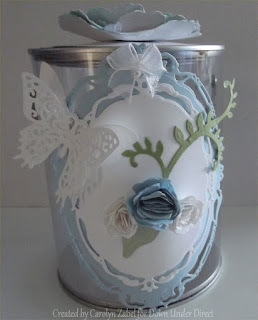 I hope you have enjoyed this tutorial the limits are endless it would be so much fun to try this in all different shapes and sizes you may like to add more than the three shapes that I have added and even add more layers. 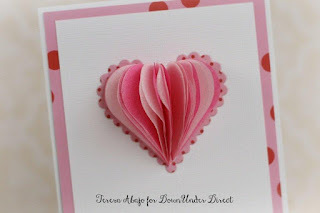 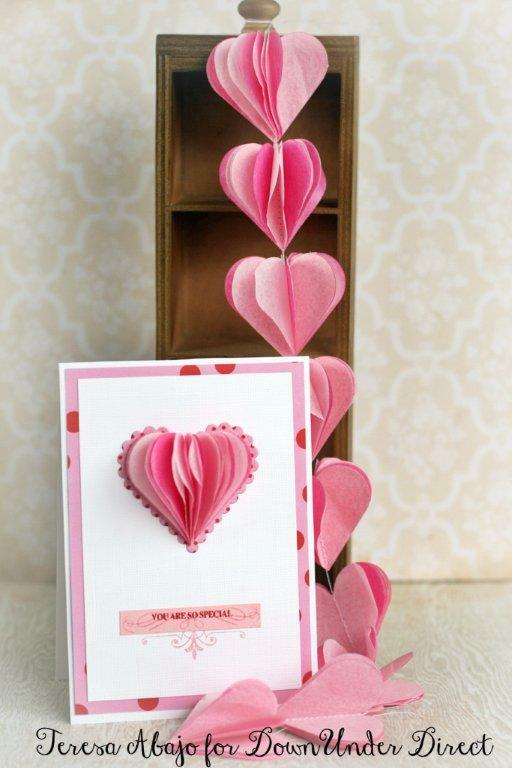 Give your love the perfect Valentine with this heart card topper or token. 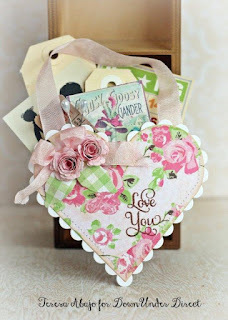 Here are a couple of projects incorporating hearts. 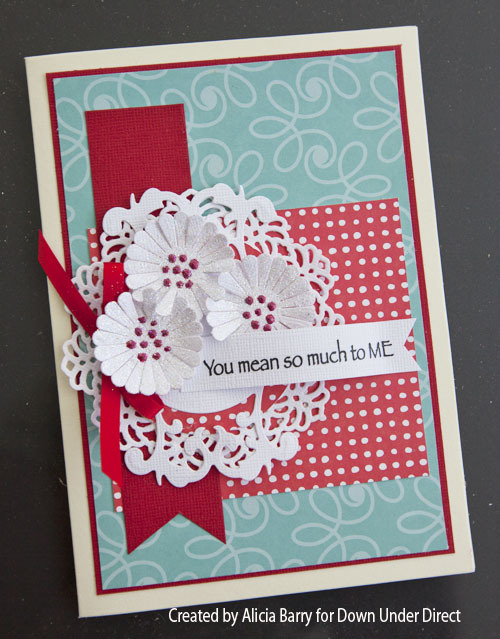 Although Valentine's Day is around the corner, this card and bunting can be used at any time of year. The tissue paper I used came wrapped around a gift, so I also got some satisfaction out of re-purposing. 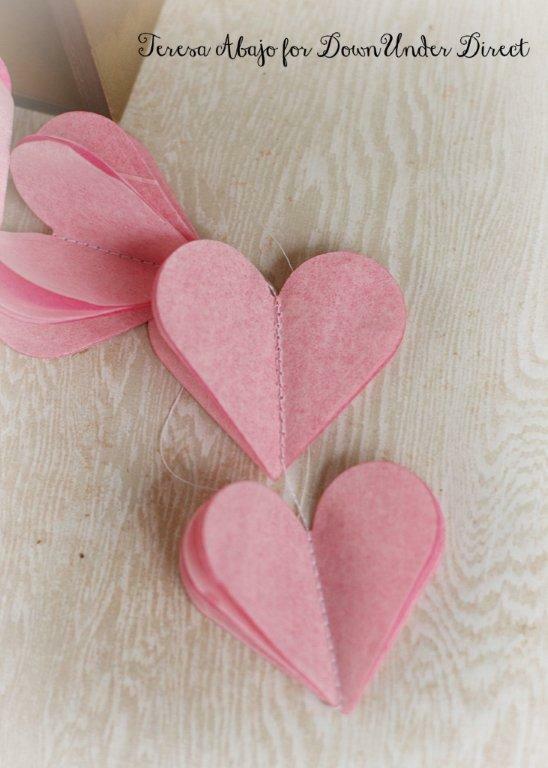 I took one sheet of light pink and half a sheet of the fuchsia and folded them up a few times. 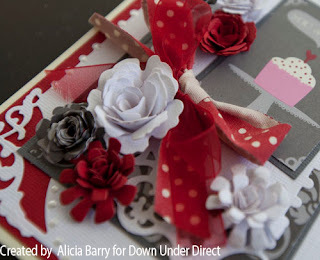 The Spellbinder dies can cut through a number of layers of tissue paper at a time, so these projects don't take as long as you'd think to whip up. 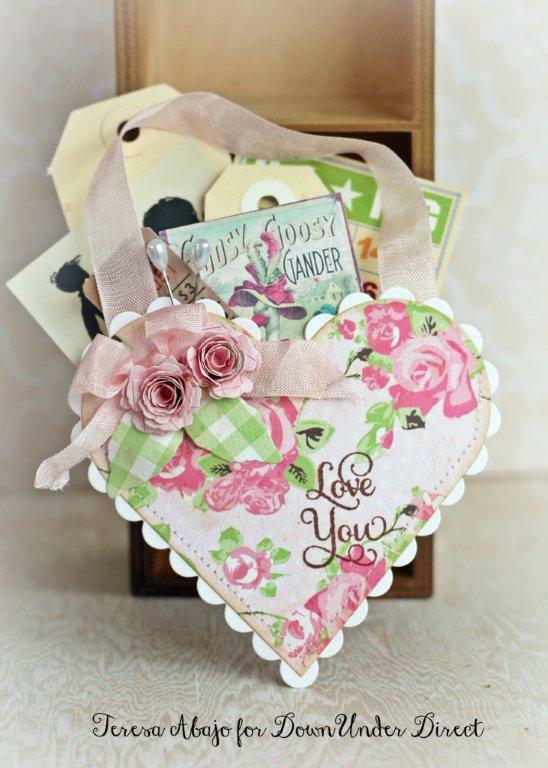 Although Valentine's isn't a huge occasion here in Australia, we thought we would share a few projects with a love theme this week. 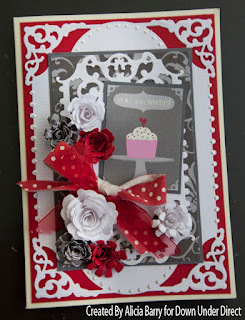 Here are a couple of cards. 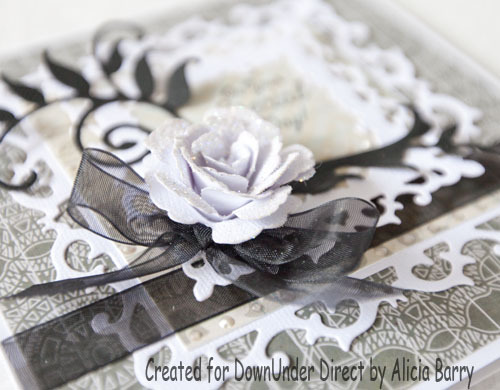 Today we have a classic black & white card.